This time next Monday there will actually be awards to be handed out in my Monday After College Football Awards. Since it has been a seemingly eternity since there was college football, let us review some of these prestigious awards that I make up for the football faithful followers. The Ugliest Uniforms goes to the team(s) that appear in yellow highlighters, glow in the dark stripes or designs, and any shade of orange. These are designed by the Hellen Keller, Ray Charles and Stevie Wonder departments at Nike, Adidas and Under Armor. Ugliest Helmets Awards have their own category. If I am unable to determine the design on the helmet it is very likely that team will receive an Ugliest Helmet Award. The Hot Seat Award is given to the coach whose coaching seat is questionable each week. The number one hot seat is currently occupied by Texas A&M Coach, Kevin Sumlin. The number two hot seat is occupied by UCLA Coach, Jim Mora. These two coaches and teams meet in the Rose Bowl on September 3. Many teams often receive the weekly Poo Poo Undies Award. This trophy is awarded to the fans whose teams survive a game winning field goal, a missed Hail Mary pass to the end zone and/or survive in overtime. There are the Exploding Coaches Awards. These usually go to Alabama’s Nick Saban for throwing the headphones or South Carolina’s Uncle Will Muschamp just because his face turns really red. Maybe it is an SEC thing. Of course there will be my Best and Worst Broadcasters Awards. It will be difficult to upset my always Best Broadcaster Boyfriend, Kirk Herbstreit and the fellows from ESPN Game Day (Not the old man!). But with Brent Mushburger silent this year, the Worse Broadcaster is a wide open category. I am expecting Jesse Palmer to be a contender. He and those who relive their days on the gridiron from decades ago instead of calling the plays all have chance. This year I am introducing a new award. It is called The Big Solid Pass Interception for Touchdown Award. There are actually two awards. One is given to the linebacker or safety that intercepts the quarterback’s pass and runs for a touchdown. The second award is given to the fan base whose team throws the interception to the linebacker or safety and cusses the loudest and in the most colorful language. Of course there will awards for the zebra people, the various mascots, chants and yells and anything else I can think of. After all, it is called Here’s What I’m Thinking. 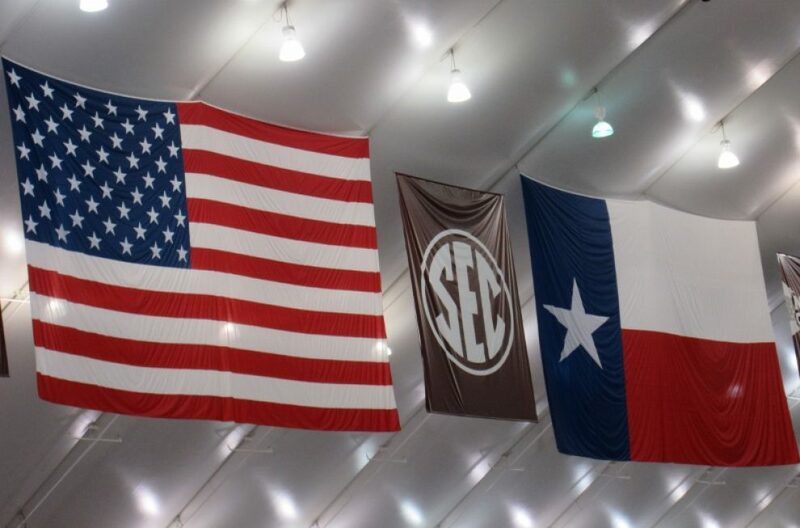 So as we say in Aggieland – Howdy Dammit! And Thank God It’s Football Season. Gig ‘Em! This entry was posted in Alabama, Coach Kevin Sumlin, Coach Nick Saban, College Football, college football, Education, humor, Native Texan, Texas Aggies and tagged ESPN Game Day 2017, Kirk Herbstreit. Bookmark the permalink. Delia, he will be ABSOLUTELY THRILLED!! He’s getting a massage now (not by me) but I’ll show it to him when he gets home AND SHARE to all his buddies!! It is a WIN WIN for him.